Casper, WY (9/5/2018) - Can-Am Driven Powersports’ Don Higbee with co-riders Jose Torres and Adolfo Arellano finished third in the Pro ATV class in the Vegas to Reno Best in the Desert Race. 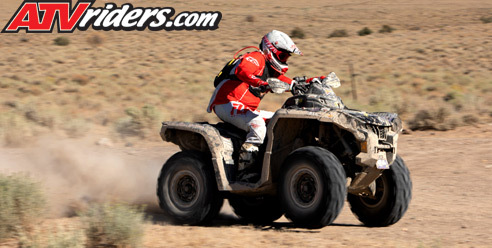 The trio competed on a Can-Am Outlander 1000R and recorded a record race pace in the process. With heavy rains leading up to the race, the 500-mile course was one of the fastest on record. Though the 4X4 ATV excels more in technical terrain, the team stayed with the sport quads for most of the race and finished a close third. Their time of 10 hours, 39 minutes set an event record for a 4X4 ATV. The key to success in long-range endurance events is dependability and the Can-Am Outlander 1000R was perfect despite the high temperatures and altitude. Kenda Tires with TireSpines made sure the team had no tire-related problems. The event represented the season finale for the BITD ATVs and the team scored another podium in points, finishing third. With only four races on the schedule, the team excelled all season. With the BITD season over, Higbee is now eying a run in the Baja 1000 SCORE event. That race is scheduled for November 14-18 in Baja, Mexico.